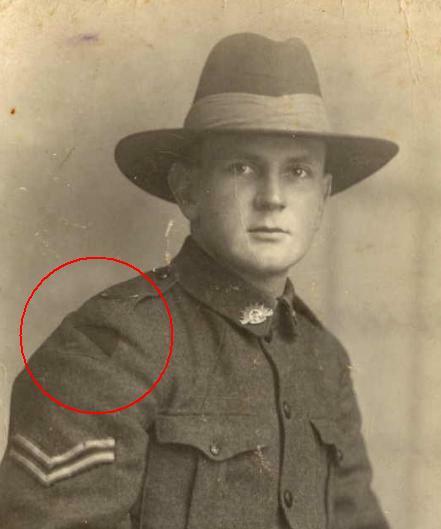 Colour patches were worn on Australian soldiers’ uniforms to show which unit they belonged to. For men in the infantry battalions, the colour on the upper part of their patch showed which battalion a soldier was part of, and the lower colour signified their brigade. from Official history of Australia in the war of 1914-1918, volume 3, published 1929. (Note that other units such as the Flying Corps, the Light Horse brigades, the Artillery, the Engineers, Transport & Supply and the Medical Corps had their own colours and designs). Someone at headquarters was obviously kept busy thinking up new designs! 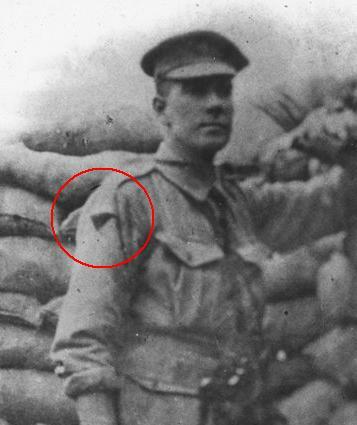 The 7th regiment Light Horse had a rectangular patch with a black upper triangle and a red lower triangle. Second Division colour patch, probably 24th Battalion. You can find out more about interpreting colour patches in our World War I: researching soldiers research guide, which includes a coloured diagram showing many of the infantry patches that were used during World War I. Upper Image is not 2nd Div. If the photo is the right way around not back to front – this man is most likely Light Horse? Thanks for the comment David. Yes- you’re right. I think using the online Bean meant the coloured patches were digitised in black and white. I shall amend the entry. I’ve got a ww1 cape, belonging to a medical corps soldier, it has over 40 patches inside ie 14RCA,Grenadier Guards,RAMC,OXF.& BUCKS,CanadiamFilm,Reconnaissance,Gameronians,lots of Rats,Bats, Bulldog,Dragons,Flags&Sheilds. I would like more information & value. Hi Criag. Thanks for you question. We do not undertake valuations, but I have passed your question on to our history librarians, to see if they can assist you in finding more information about the patches. Stay tuned! While the library has quite a bit of material on Great War military badges we hold very little on cloth patches, however variously they are named. The best source for British patches remains British Battle Insignia (volume 1): 1914-18 (London, Osprey,c.1986). It is available at a number of Australian libraries. For Canada, Distinguishing patches : formation patches of the Canadian Army (Nepean, Ont. : Service Publications, 1996.) is the relevant work. While no Australian library holds it, the title is still in print. As you can tell from the titles above, cloth patches have many names: distinguishing patches, unit patches, formation patches, battle insignia etc. Using these terms in general internet searches bring up a wealth of material. Adding country names and/or terms such as WW1, 1914-1918, Great War etc can narrow down a search. Most historical units have some sort of reference on the web, although not all will illustrate identifying patches. Google image search is also a useful tool for confirming patches. You can enter the words, initials or even descriptions of a patch and from the resulting images match your patch. Often the image will link to a page with more details. Once you have identified a unit or formation you can check for a unit history to see if one is held in an Australian library, via Trove. When you hit a snag it is often worthwhile using the expertise of others via such resources as the Great War Forum. Here you can post questions (including images) to fellow collectors or specialists. While State Library Victoria cannot value material, checking the Yellow Pages directory online with the keyword search ‘Military’ brings up most of the Australian businesses that offer such a service.